Long time friends Donald Tkachuk and Roby Sharpe have shared a lot of experiences over many years. Now they can add sharing a $1 million lottery jackpot to the list. While checking a bunch of lottery tickets, Tkachuk came across a 6/49 ticket for the Feb. 26 draw. When he input the numbers, the screen showed a message saying ‘ major winner’. 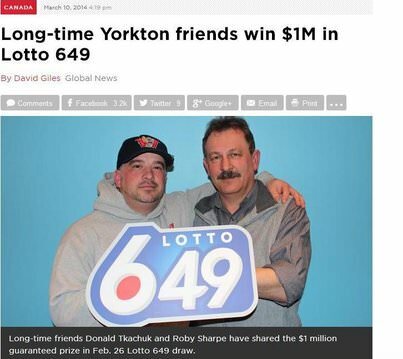 He later learned that the major win was for the $1 million guaranteed win for that particular 6/49 draw. Sharpe had a hard time believing their good fortune when Tkachuk gave him a call. It took a personal visit from his friend with the ticket and validation slip in his hands to convince him. Both plan to pay off debt and help family. Sharpe is considering getting the family cabin fixed.